Skipped a meal for our Skip A Meal Challenge? Complete the challenge and donate any amount towards the cause. Don't forget to nominate your friends. Every year, World Food Day is celebrated around the world on 16 October in honour of the date of the founding of the Food and Agriculture Organization of the United Nations in 1945. Hunger is responsible for one third of deaths in children globally each year. Hunger kills more people every year than AIDS, Malaria and TB combined. These are just some of the shocking statistics revealed by our partner World Food Programme. Human Relief Foundation has strategically placed offices around the globe, so we can respond quickly to natural disaster. Human Relief Foundation is constantly distributing food parcels to needy people in developing countries. In Jordan we are currently feeding over 20,000 Syrian refugees a month. There are many who rely on these rations for food security. Food packs are sourced locally, packed at warehouses, and then distributed. Food packs contain items such as vegetable oil, flour, tomato puree, rice, sugar, dates and other necessities. But there are still millions of people across the world who do not have enough food to survive. Click here for more about HRF’s food projects. 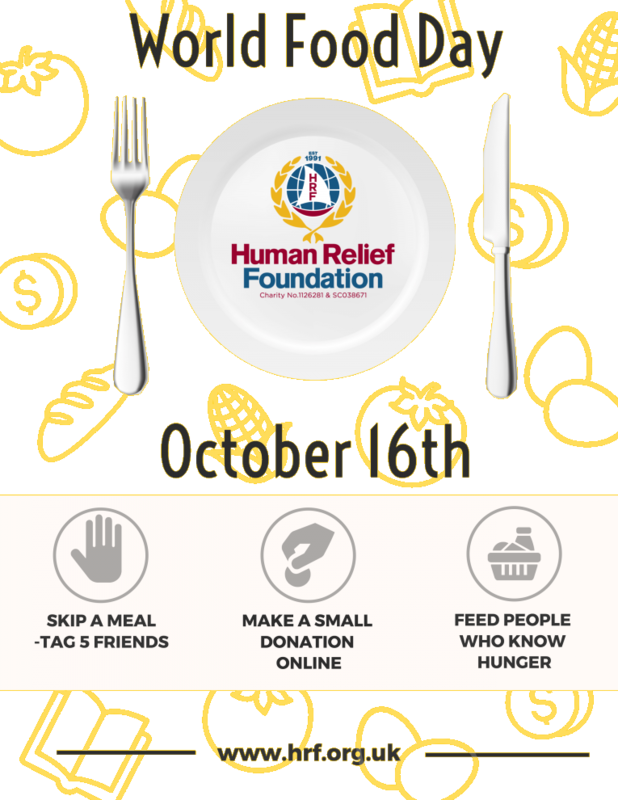 This 16th October 2017, Human Relief Foundation is inviting you to join its #SkipAMeal Challenge, which encourages people to reflect on what they eat and realise of the struggles the hungry face every day. It also enjoins people to aid a good cause. Funds and sponsorship from this Challenge will be transformed into emergency food aid for the world’s neediest people. You can donate an amount via the donation box on this page. The funds we raise together for this cause will go directly to providing food packs to the neediest people in the world.